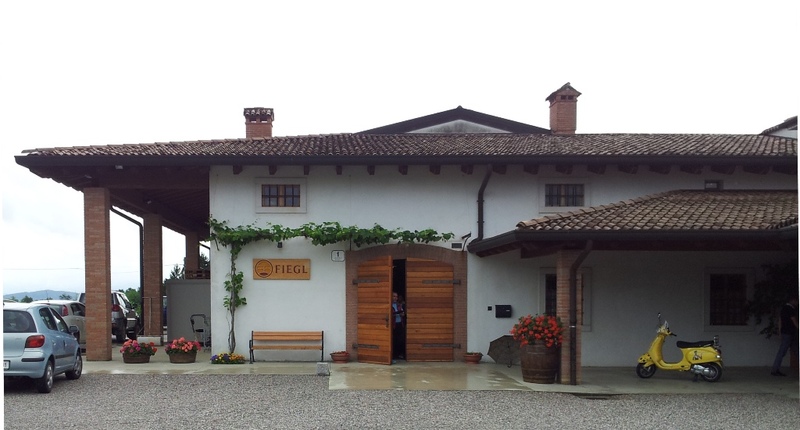 The Collio appellation, at Italy’s northeastern edge, offers an impressive array of wines. 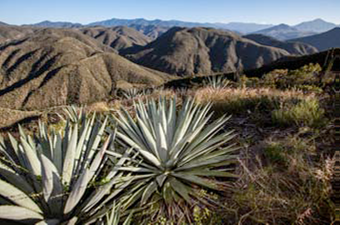 A number of varieties, both indigenous and French, thrive in its unique, mineral-rich soil and its temperate climate, buttressed by the Alps to the north and the Mediterranean to the south. Sauvignon, as Sauvignon Blanc is called there, Pinot Bianco, Friulano, and Ribolla Gialla all produce excellent wines. Merlot also thrives, as does Picolit. 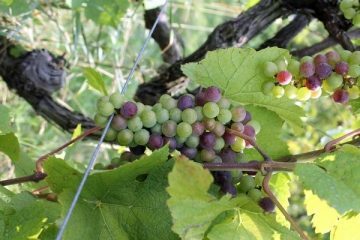 Even Pinot Grigio can approach seriousness in the Collio. However, it was Ribolla Gialla that was responsible for the most intriguing stop on a busy tour of the area this past June, a tasting with the newest generation of producers of the Associazione Produttori Ribolla di Oslavia: Primosic, Radikon, La Castellada, Dario Princic, Fiegl and Il Carpino. 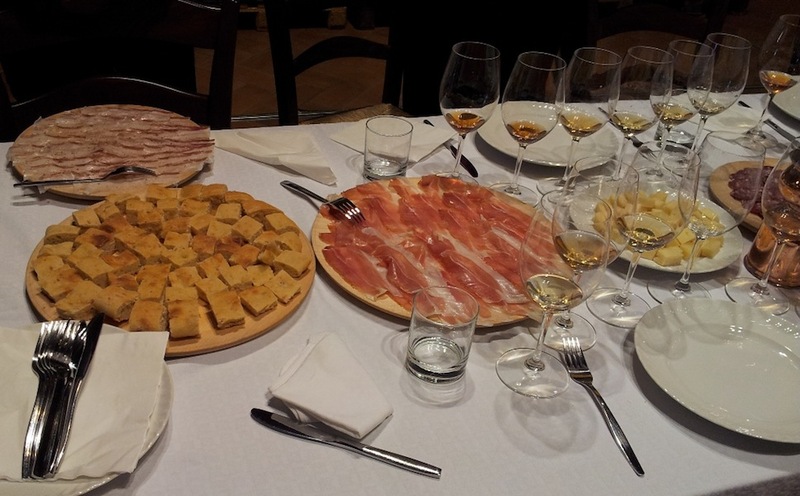 Elsewhere in the Collio, the wines labeled Ribolla Gialla are light, usually meant for antipasti or as an aperitivo. To serve that same duty, several wineries also create very enjoyable sparkling versions. In Oslavia, on the border with Slovenia, the wines of Ribolla Gialla are completely different. Their signature wines made with this variety are heavier, more complex, and just plain different. 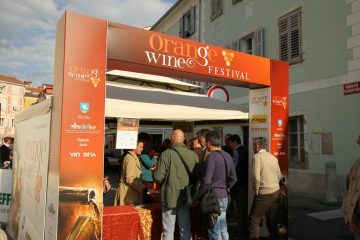 Oslavia is, after all, the spiritual home of orange wines and Ribolla Gialla is their vehicle. Orange wines are white wines made like red wines, with extended skin contact. The term orange refers to their hue. 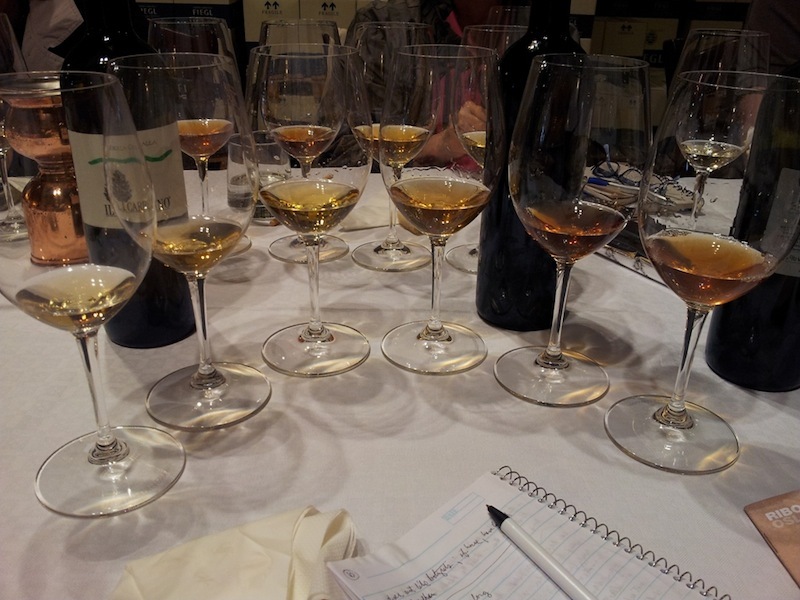 These wines can have a color that ranges from a deep yellow to amber to even orange. The prolonged contact with the skins results in tannins and additional body plus the darker color. This process provides a heft that otherwise could only come from a higher alcohol content or aging in newish wood. These wines also exhibit a greater complexity than most white wines and have the ability to age. Because of its thick skin, Ribolla Gialla is ideal for orange wines. One of our hosts commented that “contact with skin can be the oldest or most traditional method” to make wine. It was used by the older generations simply to ensure that the wines would remain drinkable until the next vintage. With the diffusion of modern winemaking techniques this method eventually disappeared. It was revived by Josko Gravner in the 1990s, and it eventually caught on with some of his neighbors in the tiny hamlet of Oslavia and their brethren next door in Slovenia. Then winemakers elsewhere in Italy and in other countries picked up on it. Still quite rare, these wines are a relatively recent phenomenon on wine lists and in stores. Their uniqueness and relative scarcity have helped make them “the indie darling of the wine world” according to an August Grub Street headline, and an object of fascination for many sommeliers, especially those with a high hipster quotient. During the visit, we tasted Ribolla Giallas made with a duration of skin contact ranging from one week to three-and-a-half months. Before this, my experience with orange wines was limited to just what I had read. The ones we sampled were not as atypical as the unusual winemaking process might suggest, and were notable for their dryness, balance, length of finish, and big mouthfeel. I doubt VERY highly that the unsophisticated palates of California Cab drinkers, seduced by richness, fatness, sweetness and lots of oak, would enjoy these quirky, strange-smelling, acidic wines with lots of volitile acidity. I think you’re missing the point as to what those type of drinkers find appealing. In fact, I don’t really find these wines appealing at all, apart from a certain geeky curiosity. I’d much rather have a clean, crisp Ribolla Gialla instead. Much more pleasurable.